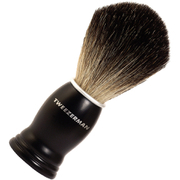 Using only the finest badger hair available, The Art of Shaving manufactures and handcrafts each Shaving Brush. All their brush handles are designed for elegance and durability, as well as for their comfortable shape. The Art of Shaving Shaving Brushes generate a rich and warm lather, soften and lift the beard, open pores, bring sufficient water to the skin and gently exfoliate. Wet Shaving Brush with hot water. Place a small amount of Shaving Cream on the tip or center of brush. Bring to a lather on face using a circular motion. To generate a fuller and richer lather, simply add more hot water to brush. 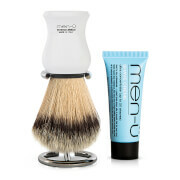 Rinse Shaving Brush well with water after each use and store on Brush Stand with bristle facing downward.